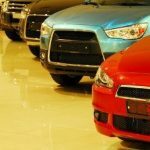 /Leasing A Car /How Is Inflating Lease Residuals Risky? 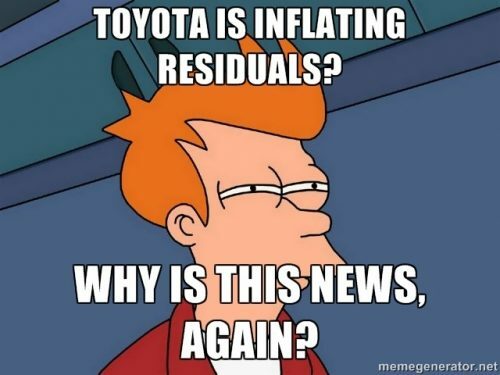 Toyota is (arguably) inflating residuals on their new vehicles to prop-up sales. Inflating residuals is “risky,” as these cars can cost automakers millions when they return off lease. Toyota is being criticized for inflating residuals, but basic analysis shows there’s very little risk involved. I find this whole train of thought to be – at best – exaggerated worry. Here’s why inflated residuals are no big deal. First, let’s understand that there are only three ways to make a lease cheaper. You can reduce the up-front cost, reduce the interest rate, or increase the residual value. Reducing up-front costs via lease cash is quick and easy, but it damages resale value. Reduced interest rates can reduce leasing costs, but only when the reduction in rate is impactful. 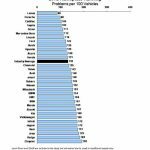 Rates are so low right now that reducing them further makes little difference. Increasing (or inflating) residual value reduces the amount borrowed by the new vehicle leasee, which reduces their payment. The problem is, that inflated residual will “come home to roost” in 2-3 years, at which time the leasing company is going to own a car for more than it’s worth. According to the Automotive News, the last option is risky. It’s not. Or at least it’s not any more risky than leasing is in general. After all, a collapse in the used vehicle market could leave Toyota (and a lot of automakers) with hundreds of thousands of lease returns that are worth far less than anticipated. But that’s a risk every automaker takes when they lease a car, and therefore not relevant. We’re talking about risks associated with inflating lease residuals, not financial calamity. Assuming an average MSRP of $24,000, our average residual value increase is $1,200 (5% of the MSRP). I sincerely doubt any of the journalists covering this story bothered to do this basic math. If they had, they would have realized that a $1,200 inflated residual on a new Camry looks an awful lot like a cash incentive…the kind the Ford, GM, and Chrysler-Fiat offer on their cars every day. No big deal. The $1,200 residual might not actually be inflated. It’s entirely possible that a 3 year old Camry will be worth $14k. Between inflation, expected price increases on new vehicles, and a (hopefully) humming economy in 2016, used vehicle prices could continue to climb. The $1,200 bill isn’t due for 3 years, yet Toyota has their money today. Toyota can set aside some portion of today’s sales revenue to cover the residual in the future, and while they wait they can earn a return on that money. Not every leased vehicle comes back. If you lease 100 cars, a good percentage of them (20-30% I’d guess) are going to be bought by the person who leased them. These people are going to either a) trade their leased Camry in on another car prior to the lease ending* or b) decide to go ahead and buy the car they’ve been driving when the lease ends. Thus, a good percentage of the vehicles with the inflated residuals carry no risks at all. Last but not lease, Toyota can always soften the blow by propping up the used vehicle market. Let’s say that every returned Camry (or Corolla or whatever) is owned for $1,200 too much. Toyota can incentivize dealers to buy the lease returns for full price by a) waiving vehicle certification fees and/or b) providing certified used Toyota consumers with special interest rates (like 1.9%). Add it all up, and the risks seem pretty damn low, don’t they? To sum up, any time someone put the words “risky” and “Toyota” in the same headline, they’re probably wrong. Toyota is as risk-averse as they come, and “inflating” residuals is nothing more than very smart incentive spending. *NOTE: If you’re wondering why a person would trade in a leased vehicle, it usually happens because they’ve gone over mileage. 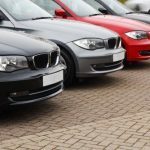 In many cases, it’s cheaper to trade in a leased vehicle than it is to return it and pay the mileage penalty. Sadly, far too many people underestimate their mileage…this is the easiest way to get burned when leasing a car, so watch out.